Marked by the return of Big Texas Beer Fest this past weekend, beer festival season is upon us here in the Metroplex. And, while you're no doubt familiar with names like BTBF, Untapped and the Best Little Brewfest in Texas, a new sort of event is on the horizon. 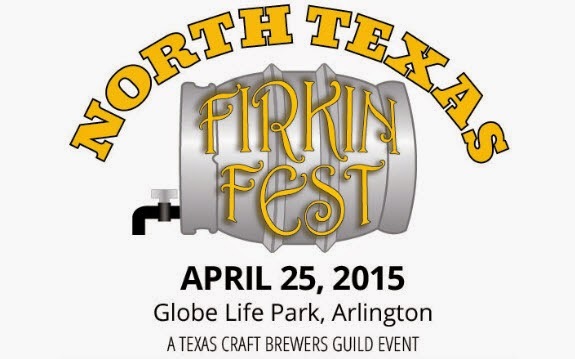 Coming to the Picnic Grounds adjacent to Globe Life Park in Arlington on Saturday, April 25 at 1 p.m., the North Texas Firkin Fest will offer up just what its name implies, an all-cask event featuring rare and one-off tappings from breweries located around the Lone Star State. Produced by the Texas Craft Brewers Guild, the same organization behind the Texas Craft Brewers Festival in Austin, Firkin Fest follows a similar affair in Houston put on by the Guild in March. It's also the first time the group will host an event in the Dallas-Fort Worth area. Currently fifteen breweries are expected to be in attendance, a full list of which can be found on the official festival website, ntxfirkinfest.com. Ticket prices range from $35 for general admission, to $70 for VIP privileges. The latter includes early entrance, a commemorative T-shirt and growler. Designated driver tickets are also available for $10, with all options on sale now at Ticketfly. Attendees will receive a tasting cup with eight sample tickets, each good for a 3-ounce pour (additional samples may be purchased on site). The beer list is included below, with the full list to be released later this week (note, in some case descriptions are adapted from those found on the respective brewery's website). Danko Colada (6.8% ABV | 70 IBU): Dankosaurus with grilled pineapple and toasted coconut. Baja Patio Pounder (5.5% ABV | 35 IBU): Patio Pounder Pale Lager with lime and coconut. Citra Dry Hopped Shields Up! (5% ABV | 45 IBU): American-style pale ale brewed with Blacklands malt, along with Cascade, Crystal and Zythos hops for a citrus and floral punch with a clean, crisp finish. Roman Empire (6% ABV | 35 IBU): English-style pale ale with added Myrtle leaves to create a spicy, herbaceous and balanced spin on a classic style. Funkytown Series - Petite Golden Sour (4.5% ABV | 1 IBU): Brewed with Brettanomyces bruxelensis var. Drie and lacto delbruckeii, Brett lambicus was added to the firkin and the beer was dry-hopped with Citra. Funkytown Series - American Sour Red (6.6% ABV | 16 IBU): Brewed with Brettanomyces bruxelensis var. Drie and lacto brevis, this beer has a Flanders Red malt bill and was aged in Icaria Winery Cabernet barrels. In addition, Brett lambicus was added to the firkin. Public Ale ESB with EKG Hops (5.5% ABV | 38 IBU): Public Ale dry-hopped with East Kent Goldings to produce a slightly hoppier finish highlighting earthy, spicy, herbal and piney notes. Legion with Blackberries (9.9% ABV | 70 IBU): Legion aged on organic blackberries to increase the depth of flavor and add a sweeter, fruity component complimenting the roasted chocolate and coffee flavors of the base beer. Capt'n Fantastic (6% ABV | 35 IBU): Oatmeal Pale Ale dry-hopped with El Dorado and Simcoe. Boombox (6.6% ABV | 32 IBU): Oak Cliff Coffee Ale with added coffee and cinnamon sticks infused with rum from the Witherspoon Distillery in Lewisville. El Chingón with Guava & Ancho (8% ABV | 76 IBU): El Chingón dry-hopped for an intense fresh hop aroma, then infused with guava and ancho. Local Buzz with Sorachi Ace (5.2% ABV | 22 IBU): Local Buzz dry-hopped with Sorachi Ace, which is known for its high-alpha aroma and intense lemon character. Citrus Hibiscus Monarch (4.3% ABV | 21 IBU): Classic American wheat ale with hibiscus, orange peel, sage and lavender tea blend added for a tart, refreshing finish. Root Beer Sir William's (4.9% ABV | 21 IBU): English brown ale steeped with sassafras, sarsaparilla and vanilla beans for a flavor reminiscent of an old fashioned cask brewed beer. Power & Light Pale with Raspberries (5.5% ABV | 42 IBU): Crisp, hoppy and refreshing session pale ale with added raspberries. Busted for Possession (7.5% ABV | 95 IBU): Blend of Stash IPA and Convict Hill Oatmeal Stout dry-hopped with whole leaf Columbus hops. Ancho Lager (4.6% ABV): Lakewood Lager with ancho chilies. Piña Colada Rock Ryder (4.8% ABV): Rock Ryder rye wheat with pineapple and coconut. Pretzel Stout with Butterfingers (6.5% ABV | 43 IBU): Pretzel Stout with Butterfinger candy for an added bit of peanut butter and chocolatey goodness. Cellarman's reserve IPA with Honeydew Melon (7% ABV | 65 IBU): Single-hop IPA with German Hull Melon hops infused with the complimentary flavors of raw honeydew melon. Sledge Hammer (11.5% ABV): Previously only available at the brewery, this triple imperial red ale has been described as Velvet Hammer on steroids. Operation Collaboration (8% ABV | 75 IBU): The brewery's IPA collaboration with Green Flash dry-hopped with the same experimental hop varieties used to brew the beer (#07270 and #06277). Ethiopian Rapture (5.7% ABV | 33 IBU): Rapture Fusion Brown Ale cask-conditioned with Ethiopian coffee from Mystical Coffee to add rich, complex coffee flavors. Simcoe and Six (6% ABV | 69 IBU): 10/6 English Pale Ale cask-conditioned with Simcoe to add distinctive grapefruit and pine notes typical of American-style pale ales to the aroma of this traditional English brew. Oak Aged Regulator (8.5% ABV | 30 IBU): The brewery's limited-release doppelbock aged on toasted American oak spirals. Iron Joe (8% ABV | 35 IBU): Iron Thistle infused with Noir cold brew coffee from Fort Worth's Avoca Coffee Roasters. 19th Anniversary Baltic Porter (7.7% ABV | 34 IBU): Malt-forward with the focus on dark malt character, this porter is a heartier brew like the inspirational beers of the Baltic region. Citra Dry-Hopped Full Moon Rye IPA (6.2% ABV | 50 IBU): A new take on Real Ale's original flagship, this edition is dry-hopped with Citra for a bright orange and tropical hop flavor and aroma. Divine Reserve 15 (10.1% ABV | 46 IBU): Originally brewed as Divine Reserve 5, DR15 has a rich, malty body full of coffee and chocolate flavors and a spiciness derived from the combination of hops and high alcohol. Divine Reserve 14 (10% ABV | 30 IBU): A Belgian Strong Golden Ale brewed with the goal of making a Belgian/American hybrid using west coast American hops and rye malt to emulate the fruit and spices often found in Belgian beers.